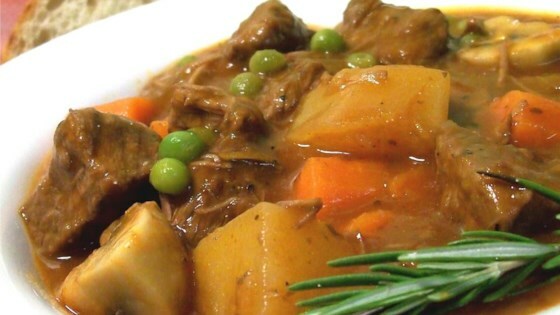 "This variation of beef stew is hearty, easy to make and low in fat. You can substitute venison for the beef. If you want to stretch out the recipe, try serving over cooked noodles." Remove any bits of fat from the meat. Heat the oil in a large pot over medium high heat. Saute the meat in the oil for 10 minutes, or until browned on all sides. Remove meat and set aside. Add the onion and tomato paste to the pot and saute over medium heat for 5 minutes, or until onion is tender, stirring often. Return the meat to the skillet along with the beef broth, combining with the onion and tomato paste mixture. Reduce heat to low, cover and simmer for 1 to 1 1/2 hours, or until meat is tender. Finally, add the mushrooms and the peas and allow stew to heat through, about another 10 to 15 minutes. Remove bay leaf and rosemary sprig before serving. This was a delicious meal, and becouse it had potatoes in it, it was a complete meal. This is great on a rainy day,to warm you up. One of the best stew recipes I've tried yet - I added white cooking wine, extra red pepper and extra vegetables and we loved it!